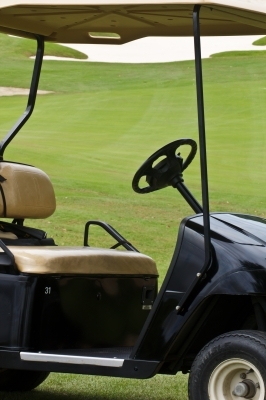 Many golf carts are virtually indistinguishable from others and are outfitted with the same basic components. All of these vehicles have an identical purpose – to haul you and the clubs to each hole. However, golf carts can be easily accessorized with a variety of goodies that your buddies will drool over. Golf carts don’t need to remain open to the elements. Enclosures can deliver shelter from the wind, rain or brisk outdoor air when on the course. Whether you’re waiting out a brief rain before your next shot or you’re tying to keep warm as the months get cooler, enclosures can protect you and the interior of the cart from the weather. Throughout various seasons, fans and heaters can be beneficial for your cart. As your physical comfort will play a part in your back swing, you don’t want the elements hindering your game. These units can help keep you cool in the summer and warm in the autumn and spring months. Nothing is worse than reaching for a warm bottle of water when playing on a course that is peaking at more than 90 degrees Fahrenheit. Many carts can be equipped with small coolers to help keep the drinks at just the right temperature. This may be the perfect solution to making sure you have enough to drink during an 18-hole stretch. Although some courses have ball and club washing stands every so-many holes, having one with you at all times can be a time and game saver. Easy to install, these units can help your game by keeping your equipment in excellent condition. After all, you don’t want a chunk of the last fairway stuck to your seven-iron to affect your short-range shot. For carts that have a backseat attached, armrests with built-in cup holders can offer your passengers comfort and convenience. As these can come in a variety of styles and colors, it’s easy to match the visual aesthetics of your cart. Depending on your style of play and determination for improving your game, there are many club car accessories that can offer an enhanced experienced. From shelter to functional, you can be the envy of your neighborhood with a cart that is decked out. Customizing the golf cart to suit your needs is only one of many ways to bring more to the game you love. This entry was posted in Sports gear and tagged golf cart, golf cart accessories, where to find cart accessories on October 2, 2015 by Mommy Yam.